Velvet touch moisturising body wash, for noticeably velvety skin. With SilkEssence, jasmine and almond oil. With Lux velvet touch, revel in the feeling of skin so irresistibly soft that it invites the caress. Specially created with moisturising SilkEssence and delicate floral notes, this body wash will infuse your skin with a light Moisturiser as you bathe in its luxurious lather, leaving it silky soft and elegantly fragrant. Expertly crafted with: SilkEssence, jasmine and almond oil and fragrance composed by the world’s best perfume experts. INDULGE NOW: Pour a drop of this Moisturising bodywash, and gently lather with a pouf. Massage all over your body to let the luxurious lather and its enchanting fragrance embrace your skin and senses every day. Step 1. Wet the loofah, pour a coin sized quantity of this Moisturising bodywash on the loofah. Step 2. Rub the wet loofah to start forming luxurious lather with a pouf. Step 3. Massage the perfumed lather all over your body for noticeably soft skin. Water, myristic acid, lauric acid, potassium hydroxide, potassium chloride, sodium laureth sulfate, palmitic acid, perfume, glycol distearate, cocamidopropyl betaine, glycerin, hydroxypropyl methyl cellulose, methylisothiazolinone, etidronic acid, BHT, tetrasodium edta, sericin, rosa gallica flower extract, jasminum officinale flower extract, prunus amygdalus dulcis oil, nelumbium speciosum flower oil, mentha arvensis leaf extract, cymbopogon martini oil, peg 40 hydrogenated castor oil, limonene, linalool, butylphenyl methylpropional, hexyl cinnamal, citronellol, benzyl acetate, benzyl salicylate, geranyl acetate, citronellyl acetate, hydroxyisohexyl 3 cyclohexane carboxaldehyde, geraniol, coumarin, benzyl alcohol. COST: INR 160 for 240 ml. The bottle is itself enclosed in a cardboard box with the same theme of colours, along with a golden brown coloured loofah.. 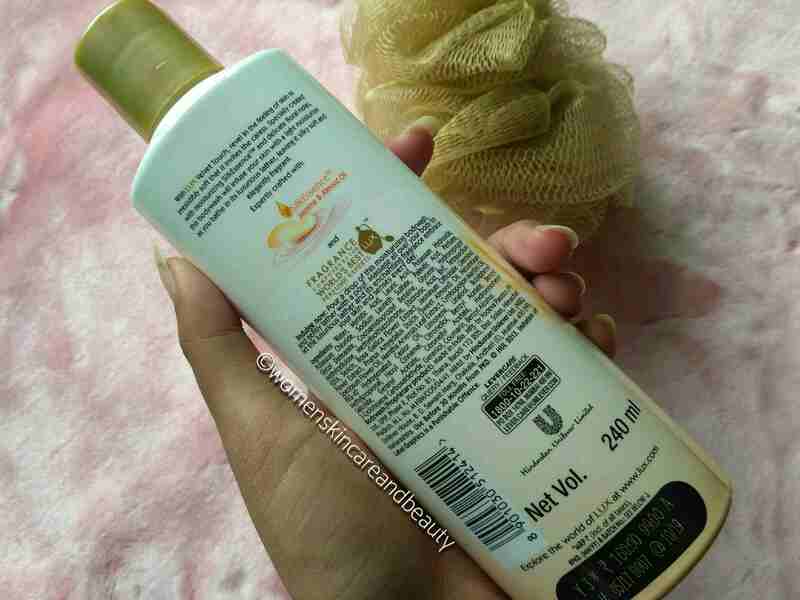 The body wash is translucent white in colour and slightly shimmers under the light.. It has a runny consistency and produces a large amount of lather( Due to the SLS present! 🙁 ).. So, I guess this won’t work well with normal to dry and severely dry skinned beauties during​ the colder months! 1. Inexpensive and easily available. Buy it from here and here! 2. Heavenly fragrance that lingers for long! 3. Cleanses the body effectively. 4. Doesn’t strip the skin off its moisture. 5. Smoothens the skin quite a bit with regular use. 1. Not at all travel friendly as lock system is absent in the cap! 2. Doesn’t stand true to its “Moisturising” claims. 3. Won’t suit normal to dry skin during winter months! Hey, I have used other body wash variants and loved them so I’m pretty sure that your confidence for this body wash will be perfect if I get one!! Wow! 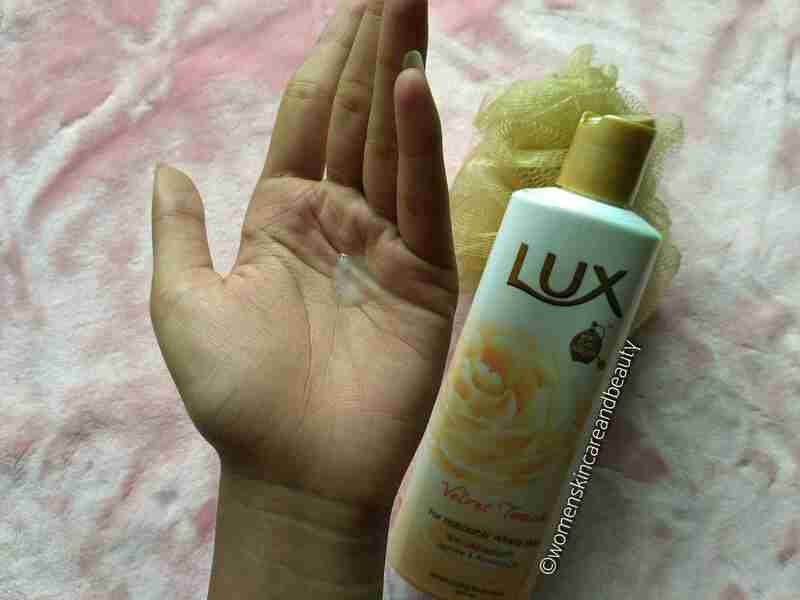 I use lux shower gel and I love it. Loved this product. I have used other variants. Will try this as well. I have used this and loved it’s awesome fragrance! It’s a great product! 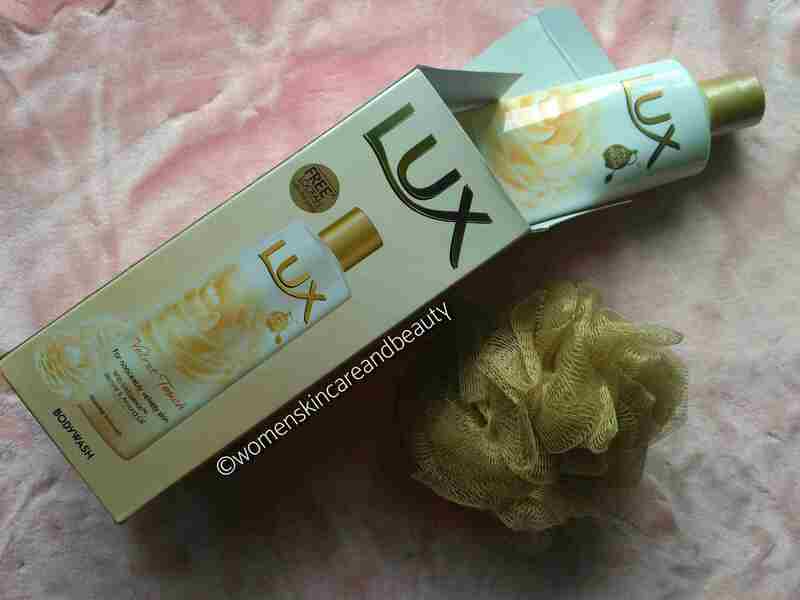 I’m extremely fond of Lux soaps but haven’t tried their moisturising body wash yet. Thanks for shaing your detailed review here. I prefer using bodywashes while travelling and also when I want some relaxing unwinding time. This seems like a good option. I have used it and liked it but the only con for me is that it contains alcohol which kind of make my skin dry. I used this body wash when i was in collage. Loved its fragrance. But now I’m very much into organic body wash. This is on the low end and good for those who want affordable products.. otherwise organic ones are the best! This is a nice balanced review. I used Lux body wash, but then it didn’t suit my skin so I switched to Wild Earth brand. A very balanced review .The skin drying out is a problem for me. Yes.. I too love all the lux body washes! Really wish this was moisturizing. It would have been perfect then. Yes.. the price for which we are getting it is really good! And the product too! Wow seems so attractive one. Just love the packaging. Cool product. This is quite an affordable body wash bit with few cons. I generally pick the pink version. I wanted to know how’s this one ? will try it for its fragrance! The fragrance is definitely awesome! Thanks for a detailed post. This looks like a good buy. It is really an affordable product! This was a real informative post. Very useful to all. Thank you for highlighting this body wash.